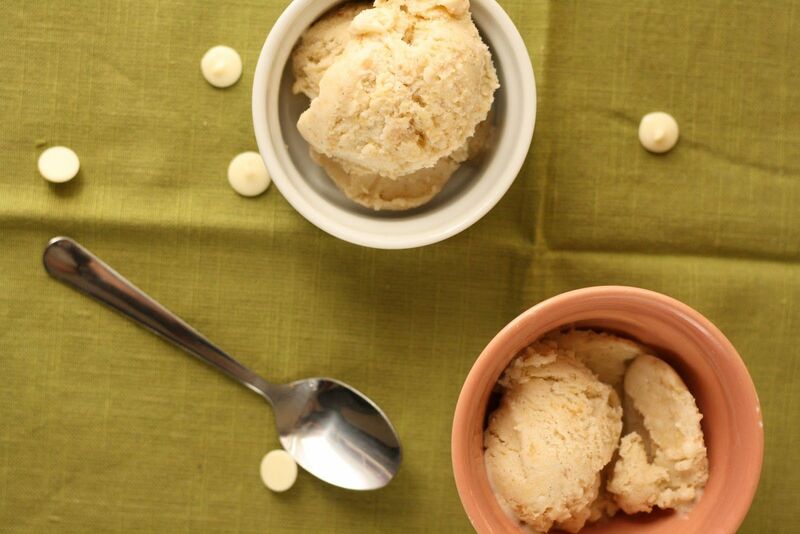 Today: White chocolate gets serious, just in time for Valentine's Day. White chocolate fans are a lonely, quiet bunch. But they're about to get some new recruits. Like you. And even you over there, with the Scotch truffle in your mouth. Most of us have spent the past two decades forgetting the white chocolate wave of the '80s, which eventually begat the Hug, and an unpleasant macadamia nut cookie scent drifting though our malls. 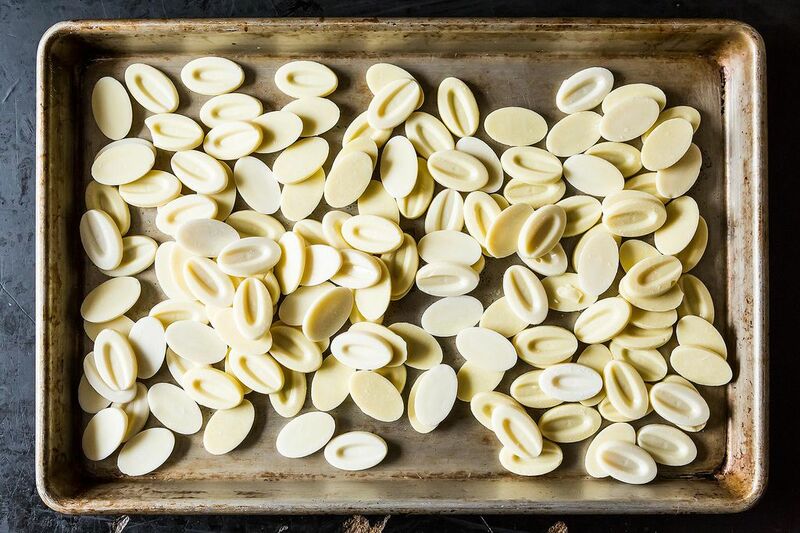 There was also the persistent rumor that white chocolate isn't really chocolate, because it only contains the butter, not the solids from the cacao bean. (Until they legitimized the term "white chocolate" in 2002, the FDA wasn't helping.) But this is a little like saying pork tenderloin isn't really pork. Matched against the brute appeal of a salty dark chocolate bar or a cookie heavy with bittersweet chips, scrawny, milked-up white chocolate never really had a chance. But it can do something miraculous that dark chocolate never could. Here's the thing: Past that pale, sweet exterior lie three ingredients with a lot of potential -- sugar, milk, and fat (in the form of cocoa butter). What happens when you expose these to enough heat? The sugars toast and you get caramel. 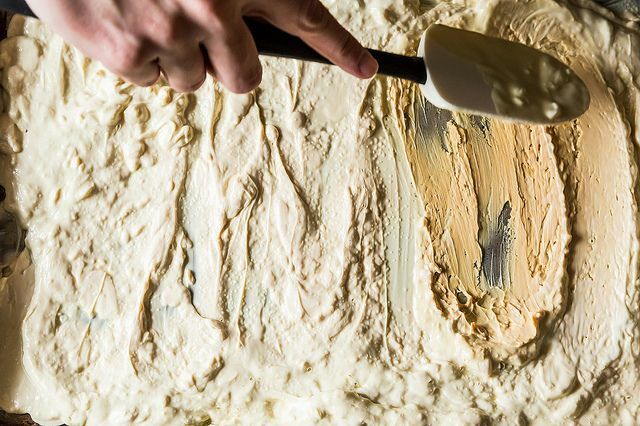 This simple alchemy was harnessed at L'Ecole du Grand Chocolat Valrhona (a.k.a. Valrhona Chocolate School). Bloggers and chefs like David Lebovitz, Ideas in Food, and Bill Corbett learned the technique through them and have since spread the gospel. 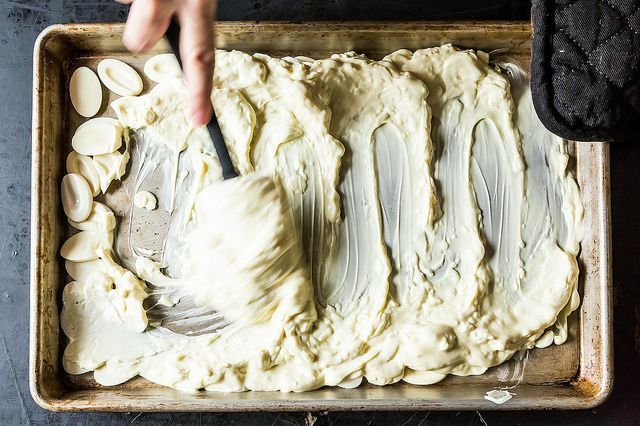 Essentially, you roast white chocolate at a low temperature (266 degrees F), for about 45 minutes, stirring and swooping it around every 5 to 10 minutes. Then you salt it. What it turns into, some call the "Toffee of Milk". Just like other chocolate, it's liquid when warm, solid when cool. 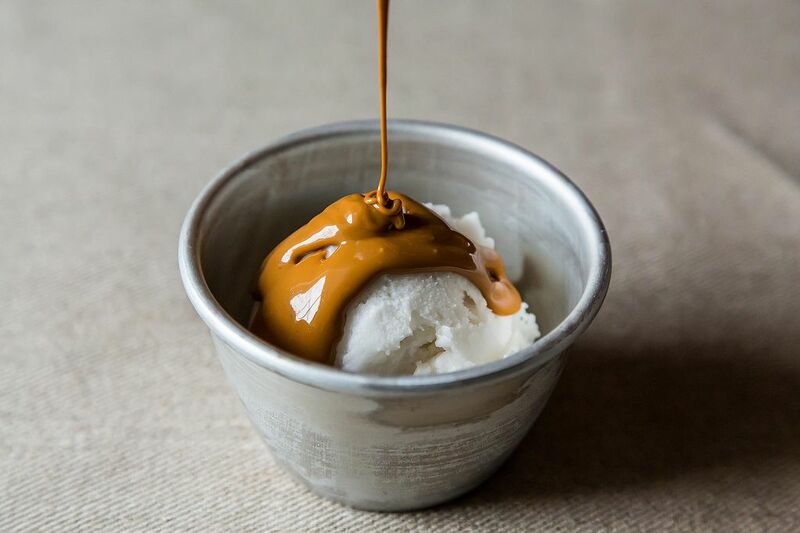 It borrows from dulce de leche with hints of cocoa flavor and, maybe most distinctively, rounded chocolate texture. As Food52er Rivka, who tipped me off to the technique, said, "It's one of the most delicious chocolate substances I've ever tasted." 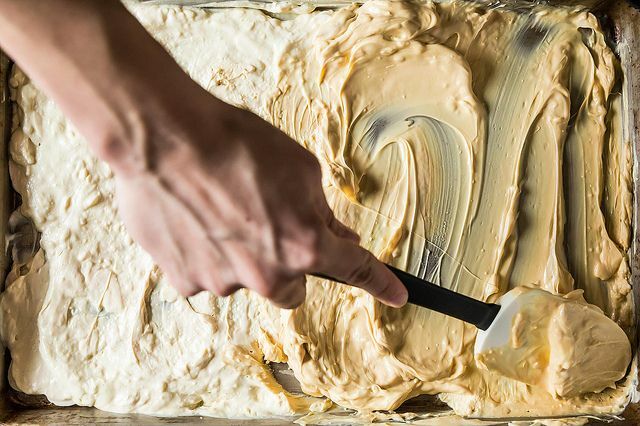 The cocoa butter proportion matters -- the higher it is, the more willingly melty it gets. 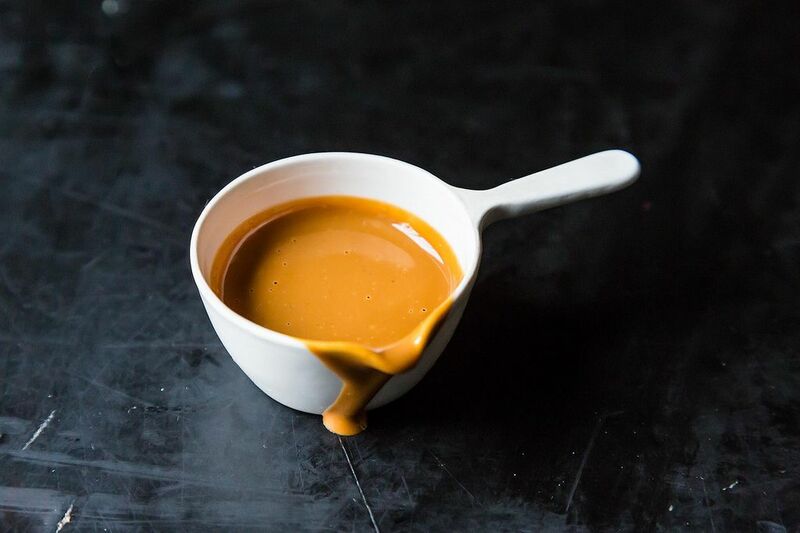 We used 34% Valrhona Ivoire Fêves, but if yours is 30% and looks a little stiffer than ours, that's okay -- just stir it often and watch it closely. Once it's the color you like, pour it into a jar and re-warm it whenever you want to get jiggy. If you take it too far and it seizes into crumbles, don't panic. It is completely salvageable and, in fact, I think it's a handier form to keep around. 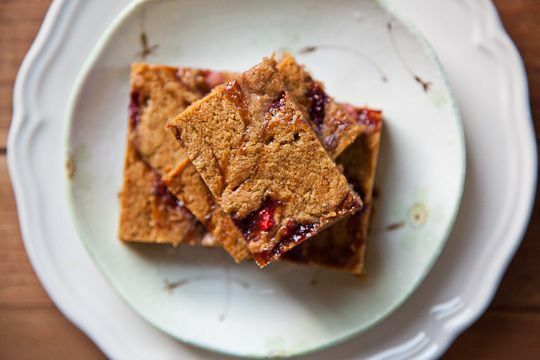 Not only can you force it to become completely smooth with the aid of a blender or a fine mesh strainer, you can also freely toss handfuls into cookies or scones, brownies or banana bread. And into your own mouth. For Valentine's Day, I can promise these three desserts have all the allure and heady depth of a dark chocolate mousse. And maybe even more, because your date won't see them coming. 2. Ganache (between two cookies, for example). 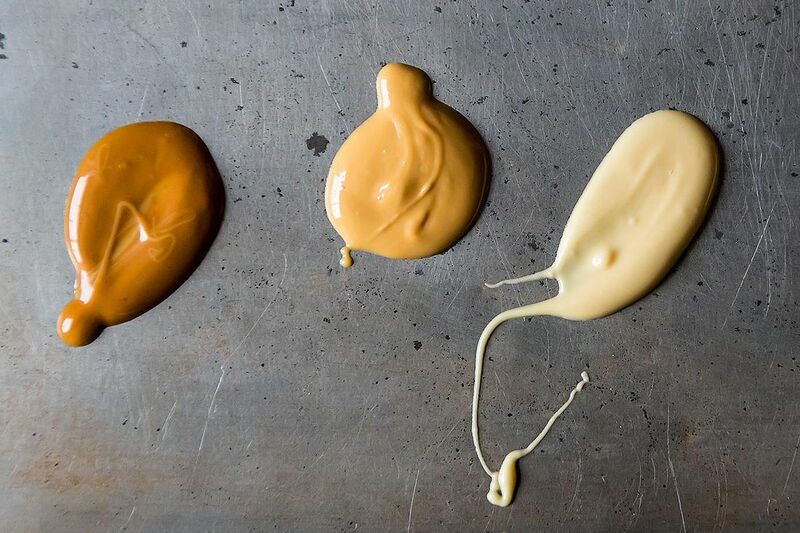 Whisk a little hot cream into caramelized white chocolate; smear between cookies. 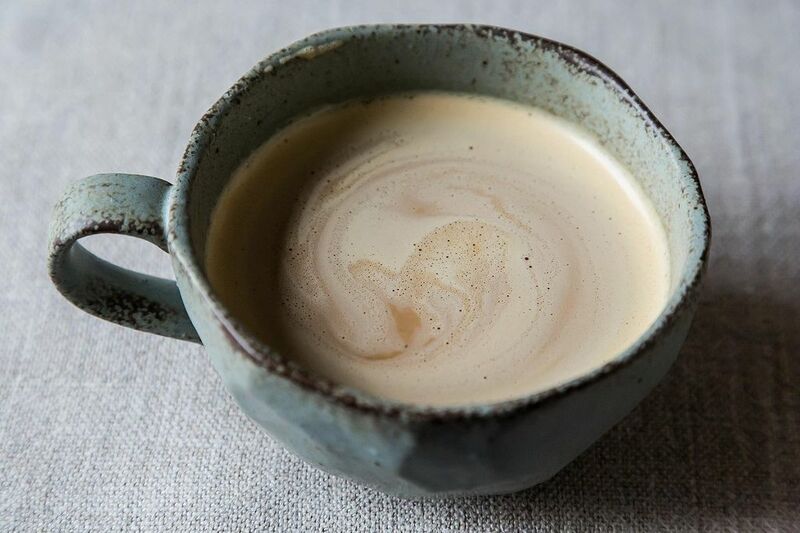 Warm up 8 ounces of caramelized white chocolate with a tablespoon of vegetable oil. Pour over ice cream. Bust through shell with spoon. As you're making your white chocolate into carmel, add fresh coconut and chopped pecans to the same pan....yes the same pan. Wait for a warm golden color, cool thick, break and enjoy! Is Valrhona's Dulcey the same thing, or is this more caramelized? question I would like to take it too far and have it seize up into crumbles to use how do i go about doing that? Is this similar to caramel, where the sweetness decreases as the amount of caramelization increases? 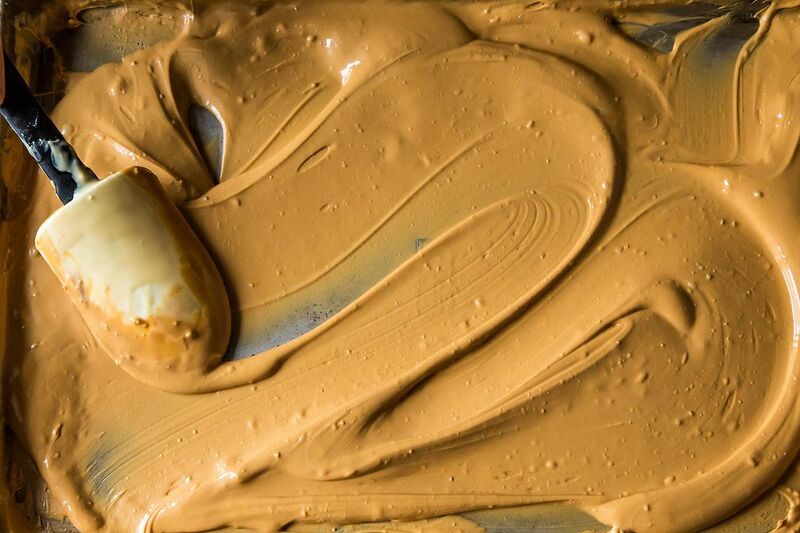 How would you say the sweetness of caramelized white chocolate compares to that of dulce la leche? I just made this using 300g Green&Blacks Organic White Choc (30% cocoa butter). I made it on the stove top in a large non stick pan with a heat proof spatula. I put it on the lowest heat on the smallest ring and it went fine, no problems just very slow. Eventually (after an hour or so of stirring every 5 minutes or so) I turned up the heat. Only then did it start to darken and need to be worked and smoothed pretty constantly, even so it took quite a while. I couldn't have done this in the oven I don't think, it was time consuming enough as it is. Just from licking my fingers I know it's very good and it looks incredible. Going to serve it over profiteroles I think, I'll let you know how it goes down. can't wait to try this! i've been trying to stay low on my calories, but oh well..how can u resist this?!? Made this tonight and had the same experience as sdebrango, thinking it was seizing when it was not. I only had half a pound so it was dark and started to melt when I stirred vigorously at 20 minutes. It's dark, delicious and I think I may have licked the pan clean. And I don't have a big sweet tooth. That's so fast -- do you have a thermometer in your oven? I wonder if it runs hot, or has hot spots. Don't worry though -- dark brown is when it tastes best, I think. 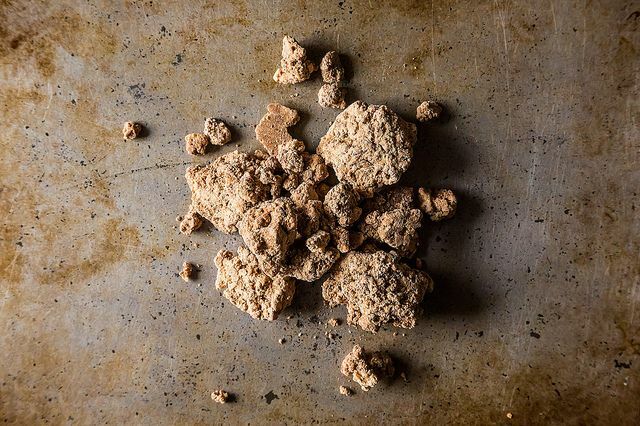 Click through to the recipe page for how to turn the crumbles smooth again. Or you can always bake them into cookies, etc. This might actually be THE most brilliant thing I have ever seen. I HAVE to try this. Thanks so much! what is the best way to reheat the white chocolate caramel? I warm mine (in the jar pictured above) in a pot of barely simmering simmering water. Or if you keep yours in a jar without any metal bits, you can reheat in the microwave on low power. So glad that I can now own my love of white chocolate without being scorned! 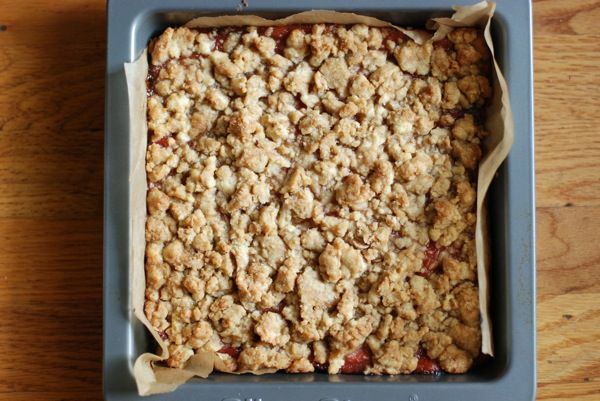 These desserts look swoonfully delicious. 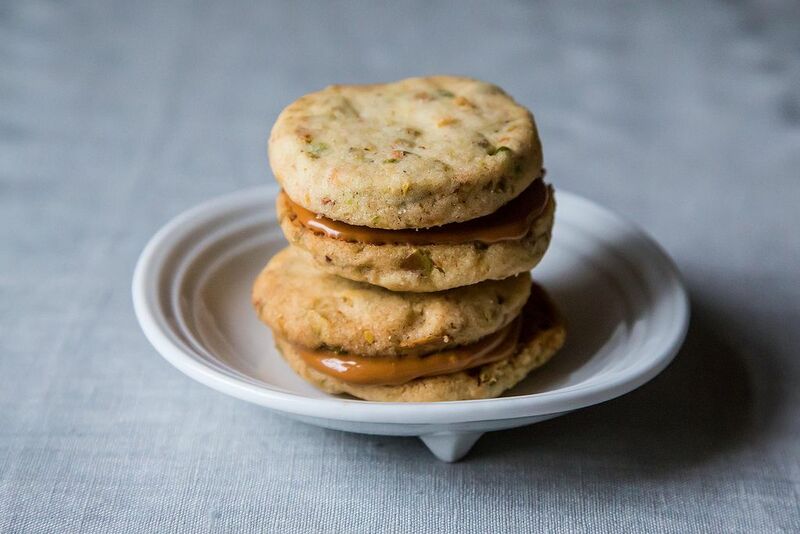 And white chocolate has another champion, too: Deb, of Smitten Kitchen. I agree with her that it pairs beautifully with berries. I'm thinking that her white chocolate concoction needs yours as topping number two. I know what I'll be cooking when the blizzard traps me in. Wow! This is simply amazing. Never heard or seen anything like this. I always find white chocolate to be very one note. But this looks very different. I am definitely saving this up and making it soon. Where can I buy that particular brand of white chocolate? I found it at Whole Foods on the Bowery, actually! But if you can't find it, any good white chocolate will work. Thanks Kristen, I'll look for it at the Princeton Whole foods. I had such a terrible experience with the ghirardelli white chocolate chips. Found out later that the company is getting sued for misrepresenting the ingredients in their white chocolate product. I love white chocolate as much as I love milk chocolate, which is a whole lot. I'm wondering how it compares in taste to dulche de leche. Great question. I'm making some tomorrow or Friday, and will let you know. It's definitely still got the mouthfeel and milkiness of white chocolate, but with a caramel twist. 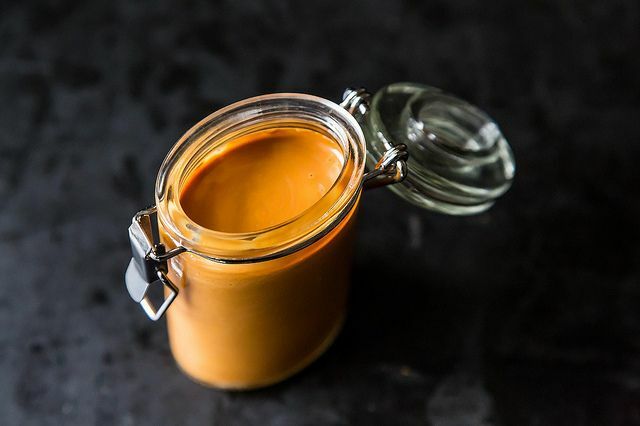 It is, however, just as addicting as dulce de leche! Great, great photos! I live w/ some white chocolate lovers, so this is perfect. I will certainly do this. This is my fave column - I love the Genius Recipes! I have to admit to having white chocolate seize and burn as it cooks fast. These are really good ideas! There is no such thing as White Chocolate. Because in fact, the very choco ingredient component that is the makeup of chocolate bean, which is what gives the bean its color and flavor when processed, has been removed, which make the very concept of white chocolate an oxymoron. Its real name should albino chocolate. On top of which it tastes like sh**. Yum!! I always tell my kids, "chocolate is good for you." This looks really good for you. Fanfreakingtastic! I'm getting a vision of caramelized white chocolate mousse. Oh good heavens, what a luscious idea. I am not a chocaholic. Once in a while I love some very dark chocolate. White chocolate is something I keep to add to things like scones or bread pudding. THIS is a recipe I must try! Thank you so much!